Hi guys this is my first post so i guess this is an intro duction as well. Ok so im going to culinary school (about 3 months now) and would like a decent knife, i got a set of knive when i started but would like to trade up. ive been looking around and found this on ebay... and could not find anything about the company that makes it, does anyone here know anything about this knife? The blade steel itself is quite good. Shun and many other manufacturers on Japan Woodworker use laminates in VG-10. But there is one problem. If you look at the front bolster, it is thick as it is shaped into the blade. As the edge is sharpened in the future the bevel wears away slightly, but the bolster is still thick and in the same plane/place. After a period, the edge is "eaten" up and it cannot come fully down onto the cutting surface as the bottom of this bolster forms a "foot." Go to JWW and look at the gyutos that have a heel going fully to the rear of the blade. 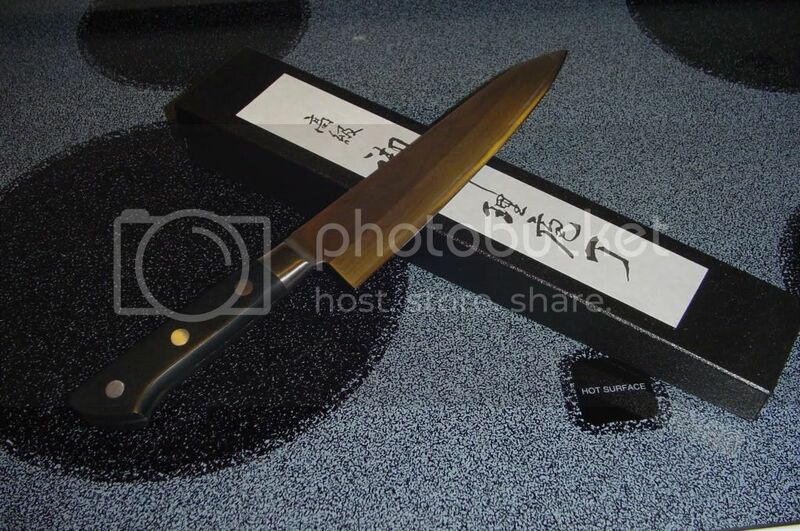 And BTW, *ahem* you will also need the services of a good sharpener who specializes in Japanese style knives. A good tinker is worth his wages. Here is one that I sharpened. ok thank you very much for the reply. I'm a rep, but I think your average guy named Joe can get the exact knife for 100 bucks. And customer service is superb. Ask for "Ginny." She's a go-getter.